Several question types in Quizmaker 360 use radio buttons or check boxes for answer choices, and you can format them to complement your quiz design. 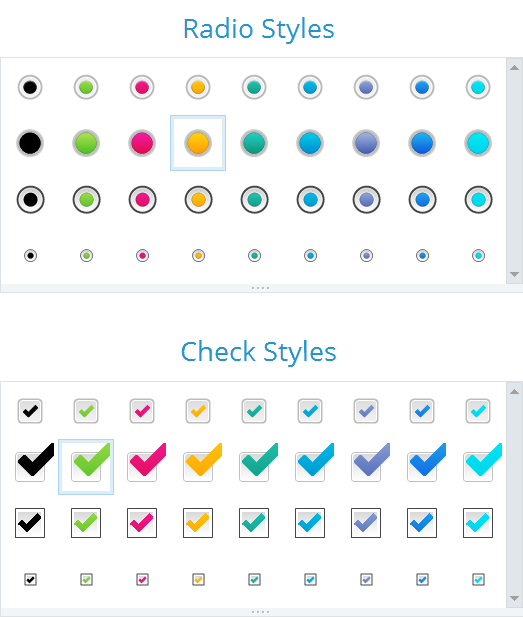 Quizmaker has a gallery of predefined button styles. Just click the one you want. In Slide View, select a radio button or check box from your question. Go to the Format tab on the ribbon. If you'd prefer to use custom colors for radio buttons and check boxes, you can do that, too. In Slide View, select a radio button or check box. Radio Fill/Check Fill: Select a color to fill the background of the button. For a transparent background, choose No Fill. If you don't see the color you want, choose More Fill Colors to define a custom color or use the Eyedropper to match a color from your visible screen area. Radio Border/Check Border: Select a color for the button's border. If you don't want an outline, choose No Border. If you don't see the color you want, choose More Border Colors to define a custom color or use the Eyedropper to match a color from your visible screen area. To change the thickness of the border, choose a Weight. Radio Color/Check Color: Select a color for the radio button or check mark. If you don't see the color you want, choose More Radio Colors or More Check Colors to define a custom color, or use the Eyedropper to match a color from your visible screen area. Tip: The default color choices are controlled by your theme colors. After customizing a radio button or check box, you can set it as the default style for all new buttons in the same quiz. Just right-click it, and choose Set as Default Radio Button or Set as Default Check Box.